Day one was a success and a great opening to the week! The first event of the day was the Technology Showcase hosted by Duke's Office of Licensing and Ventures (OLV) and sponsored by Hutchison Law Group PLLC. 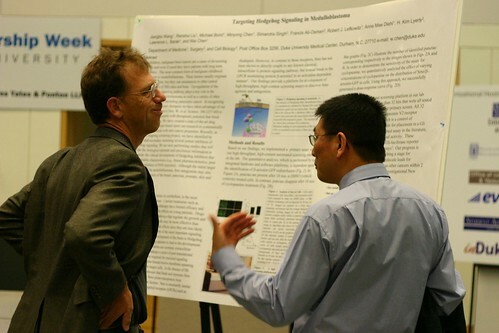 The event was held in the Kirby Winter Gardens at Fuqua, and attracted a crowd of VCs, independent investors, inventors, lawyers, entrepreneurs, students, and faculty. After the Tech Showcase, Aerie Pharmaceuticals presented in Faculty Hall. Aerie is a biotechnology company developing new therapies for sight-threatening diseases of the eye and is based on innovations from the labs of David Epstein, MD, Chairman of the Department of Ophthalmology, and Eric Toone, PhD, Professor of Chemistry. At 6:30, Howie Rhee opened the kick-off party and shared the stage and mic with Chris Lynch from Wyrick Robbins Yates & Ponton LLP, the headline sponsor for the week, and eWeek co-chairs Larry Boyd, Jeff Clark, and Jeremy Welch. 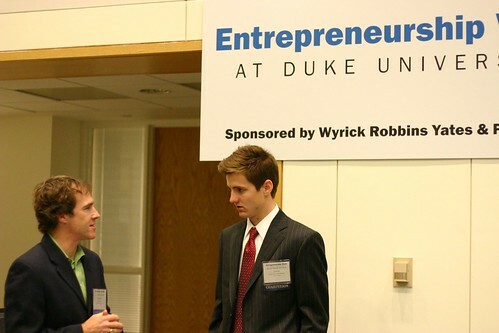 Jeff spoke briefly about Duke University's entrepreneurial roots and the bright future ahead. Chris Lynch followed with a few words about his firm and their history of support for entrepreneurs from Duke. Tomorrow is the Undergrad Entrepreneurship Panel and Entrepreneurship Mixer at Tyler's Taproom. Check out the eWeek at Duke homepage for a schedule of events for the rest of the week. Good site, The people inside the extra created nations don't exclusively have the instruction and furthermore the data that they utilized for the occasion of their nations anyway they even have the http://www.medicalfellowship.net/medicine-fellowship-personal-statment-help-services/cardiology-fellowship-personal-statement-service/ site ready to utilize their data in the best way they'll. Incredible endeavors by the site which encourages many individuals who are committed towards their work, so to end the extraordinary changes in this assignment writing service australia is remarkable and brilliant.